This is a traditional word-by-word explanation of a hashiya (gloss) on Shaykh al-Sanusi’s popular matn in Islamic theology, Umm al-Barahin. 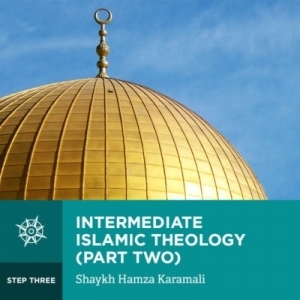 Hamza Karamali carefully works through the second half of the Hashiya in 74 recorded lessons, unpacking its meanings, and relating them to contemporary theological problems related to modern science, Western philosophy, and Wahhabi theology. These include the transcendence of Allah Most High; the figurative interpretation of Qur’anic verses and hadiths that seem to imply that Allah Most High resembles His creation; the “problem” of evil and suffering; the “problem” of divine omnipotence; the reality of natural causation; the relationship between morality and God; the meaning of the concept of “God”; the kalam cosmological argument for the existence of God; the Big Bang and the beginning of the universe in modern cosmology; the philosophy of numbers and mathematics; and miracles. This is a course for experienced students of knowledge who have studied the Islamic sciences for many years. This course is a traditional word-by-word exposition of one of the most popular Azhari manuals in Islamic theology, Shaykh Ibrahim al-Bajuri’s (d. 1276 A.H. / 1860 C.E.) Hashiya on the Umm al-Barahin of Muhammad b. Yusuf al-Sanusi. Shaykh al-Bajuri was a prolific scholar, authoring commentaries and glosses in many different Islamic disciplines, including theology, logic, hadith, Sacred Law, estate division, Arabic morphology, Arabic grammar, and Arabic literature. His works have been highly regarded by generations of teachers and students for their precision, comprehensiveness, and depth of scholarship. He studied and taught at al-Azhar, becoming its foremost scholar and rector (Shaykh al-Azhar) in 1263 A.H. / 1847 C.E., a position that he retained until his death. His Hashiya on the Umm al-Barahin is one of his most widely studied works. Hamza Karamali earned his BASc. and MASc. in Computer Engineering at the University of Toronto, after which he moved abroad to study the Islamic sciences full-time in private settings with distinguished traditional scholars in Jordan, Kuwait and the UAE, reading and memorizing traditional works in all of the Islamic sciences. He taught the Islamic sciences online at SunniPath.com, then at Qibla.com, then taught advanced Arabic grammar and rhetoric at Qasid Institute, and then joined Kalam Research & Media, where he worked for three years, designing, managing, and participating in research and education projects around the integration of modern analytic philosophy and science with traditional Islamic theology and logic. He is the author of The Madrasa Curriculum in Context, as well as a forthcoming work that presents traditional Islamic logic in the idiom of contemporary logic and philosophy. Hamza joined SeekersHub in 2016, where he has taught courses on logic, legal theory, and Islamic theology. He also has a regular podcast and video series called Why Islam is True, in which he applies logic and traditional Islamic theology to answer contemporary questions about belief in God, the genuine messengerhood of the Prophet Muhammad (Allah bless him and give him peace), and the truth of resurrection and the afterlife.